How many of you agree that you are true Star Trek Series? If, answer is NO than you are about to miss something this Halloween! As its Star Trek’s 46th Anniversary, it will be one of the Hottest Halloween Theme Costume Ideas for Adults & Kids. It was in the year 1966 t0 1969 Star Trek Series took the TV by storm. Every child in that era was a Star Trek fan and still are Star Trek Fans. What is surprising is that people are still fans of Star Trek and are passing on it to their children & grandchildren. 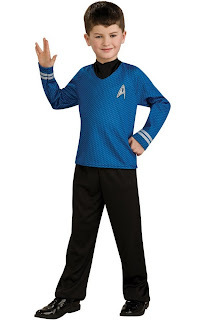 There are many Star Trek Costumes available on PartyBell.com for Adults & Kids. Description: Includes dress. Does not include shoes. This costume was inspired from the re-make of Star Trek movie in 2009 directed by J. J. Abrams. This Star Trek Costume includes Dress, Dickie, and Pin. Tights and boots not included. Description: Includes:Shirt. Pants and shoes are not included. For those who want to get traditional Star Trek Classic Red Dress Deluxe Adult Costume, this Classic Short Red Star Trek Costume is perfect option. This Star Trek Costume includes Dress. Boots not included. Make it a Couple Costume this Halloween with this Men’s Star Trek Secret Wishes Red Costume. Description: Includes: Shirt. Pants and shoes are not included. 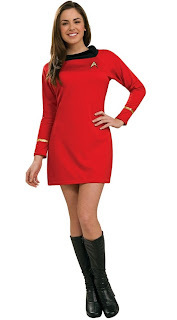 This Star Trek Classic Red Dress Costume is also available for your little Girl. Description: Includes: Dress, Dickie. Shoes not included. Description: Includes: Shirt, Dickie, Pants. Shoes are not included. 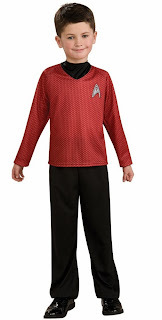 This is an officially licensed Star Trek ™ costume. 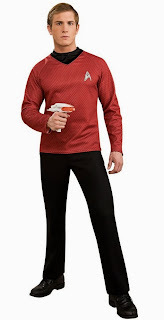 If Red is not your color go for this Star Trek Golden Costume for Men, Women & Adults. The color which popular Star Trek Character Dr.Kirk use to wear in the series. 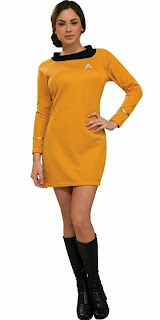 Join the Starfleet in this Golden Star Trek Deluxe Dress. If you don’t want to go for this Short Dress, you can opt for Star Trek Next Generation GoldJumpsuit Deluxe Adult Costume which is easy to carry. Description: Includes: Jumpsuit, Pips, and Pin. Were you Dr. Kirk Fan, than this Star Trek Movie Grand Heritage Gold Shirt Costume is what you should opt for! Description: Includes: Shirt. Shoes, weapon and pants are not included. Description: Includes: Shirt, Dickie, Pants. Shoes not included. 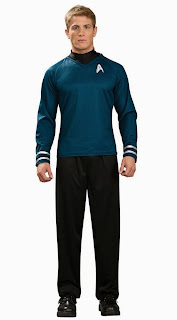 This is an officially licensed Star Trek™ costume. Become a part of USS Enterprise in this Star Trek Blue Fleet Costumes. Description: Includes: Dress. Boots not included. This Halloween pay tribute to Star Trek Character & Series by dressing up in Star Trek Costumes.